John Rivers recalled his times visiting the Kingsway with his Grandmother, who was an usherette and cleaner at the cinema. In the background are four petrol pumps commonly seen in the early 1950s, John’s father was able to name them as belonging to Central Garage. 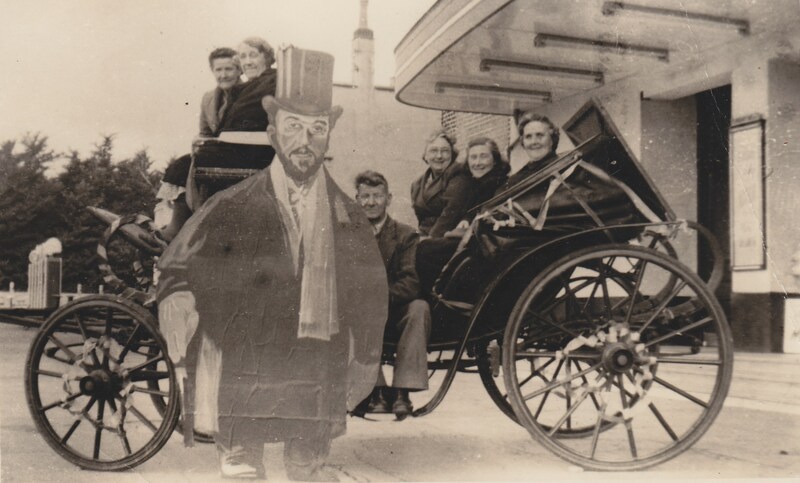 The person in the carriage closest to camera was Margaret (neé Rivers) McCormack, shown helping to stage a promotion for the 1952 Best Picture Oscar-winning film; Moulin Rouge. The Oscar for Best Actor went to the same film’s star Jose Ferrer in his role as Henri Marie Raymond de Toulouse-Lautrec, often abbreviated to just Toulouse-Lautrec, who is seen in the larger-than-life cardboard cut-out. Supporting actress Colette Marchand was also awarded an Oscar, and other actresses in the film included Suzanne Flom, Zsa Zsa Gabor and Katherin Kath. I remember the film. The leading actor spent much time with his knees stuck in a pair of shoes. It was a visual extravaganza, a sad story and an old Paris setting especially remembered for its atmospheric lighting.